Yoghurt Prawns Curry is one of the simplest form of Curry or Masala which goes very well with Hot Rice, Chapati's and Dosa's. Wanted a quick side dish for our dinner and I was not in a mood for any lenghty cooking process. So tried out this simple Prawns Curry with Yoghurt and it turned out to be soooo good. This dish consumes very less ingredients and is done within minutes. 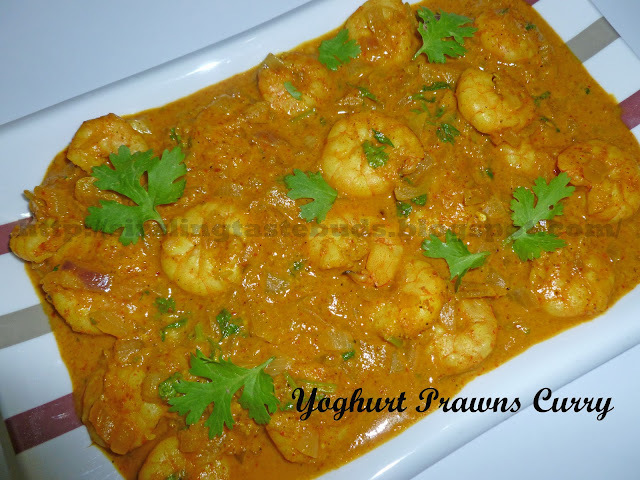 So here's the recipe for Prawns Yoghurt Curry/Masala. 1. Wash and Clean the prawns and keep it aside. 2. Heat 2 tsp oil in a kadai and add chopped Onion to it. Fry till it gets slightly brown in color. 3. Add Ginger garlic paste and saute it for a minute. 4. Now add cleaned prawns, Haldi and fresh Yoghurt. Mix well and Cover it with a lid and cook it in a medium flame for about 5 mins. Don't add water. Let the prawns cook in yoghurt. 5. After Prawns are half done add remaining spice powder like red chilli powder and Garam Masala powder. Add Salt to taste and cook it for another 3-4 mins till prawns are done and the gravy thickens a bit. 6. Garnish with fresh coriander leaves. 7. Serve hot with rice, chapati, dosa or any thing you prefer. Slurp,fingerlicking prawn curry..Thanks for sending to COG. .i am cooking this once in a month atleast..